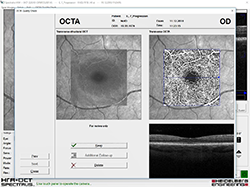 The SPECTRALIS® software version 6.12.1* comes with new features designed to improve workflows in glaucoma and retina management. The new features will mainly enhance the usability of the Glaucoma Module Premium Edition (GMPE) and the OCT Angiography Module. A comprehensive clinical assessment with these modules has never been this easy. View essential diagnostic information tailored to the patient’s anatomy in a layout that enables a quick yet comprehensive patient assessment from the rim to the macula. 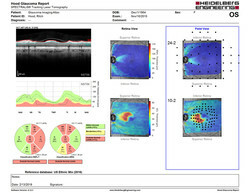 It allows clinicians to visualize structural measurements along with high-resolution OCT B-scans and relate this information to correlating 24-2 and 10-2 visual field points. Visualize minute changes on posterior pole scans with a new optimized color scale. 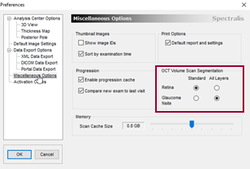 Check OCTA scans immediately after acquisition. Save time by deciding at a glance whether to keep or to repeat the scan. Benefit from a faster and more efficient experience for the patient and operator. Customize your segmentation preferences and additional print report options directly within HEYEX. Benefit from reduced processing time and simplified report generation. If you are interested in purchasing SPECTRALIS, the multimodal imaging platform optimized for the posterior segment, please get in touch with your local sales person. * SPECTRALIS® software version 6.12.1 is CE-marked in certain countries. This software version may not be available in your country. Please check with your local sales consultant.